Factory trained and certified installers allows for fast and capable transfer of facilities from the contractor to the owner. 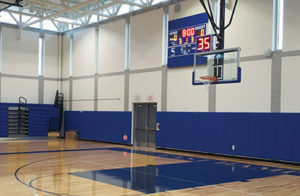 Engineers, Designers, Project Managers and their teams of technicians are well trained and eager to help you realize the vision for your athletic facility. We offer the best warranties in the industry and are proud of our strong record of standing behind our products. Is your facility in need of a safety inspection? National Equipment & Facility Solutions can ensure proper evaluation of your facility equipment. Our 29-point check list will cover from floor to ceiling and everything in between. Contact us online today or call 203-232-0214 to schedule your appointment. Your Facility Has Needs. We Have Solutions. Inspect, repair and upgrade all types of backstops. Wall mounted, ceiling suspended, single or double drop, telescoping stationaly wall mounted and fold up or side fold backstops. We will develop innovative solutions to meet your most challenging facility requirements. 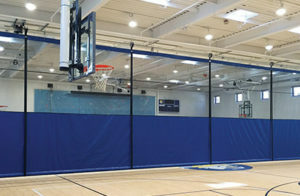 Backboards, rims and padding will take the most beating in your gym. Constant care for these pieces must be taken to ensure safe play for your gym members. Structural soundness, proper wear and product integrity needs to be tested and maintained. 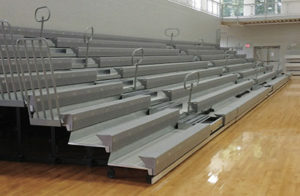 Repair, Upgrade, Replace or Install we can handle all your bleacher issues! Under the bleachers is where all the action happens, keep your bleachers in good working condition to reduce damage and injuries. Our “Factory Certified” Technicians are on hand to manage all your bleacher needs. These cages have a variety of uses including golf, tennis, soccer and more, allowing for practice year round. 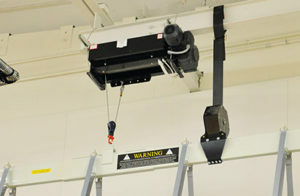 The cage is easily raised and lowered by a drive shaft powered by an electric winch. Remember because no two facilities are the same, we will customize to your needs. Service and maintenance are critical when dealing with an item that is constantly in use. A little service now can prevent complete replacement later! We have extensive experience with all types of curtains, power controlled Fold-Up, Top Roll, Slope or manual Walk Draw. 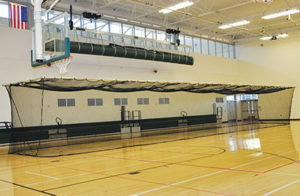 Operable walls are also on our list of serviceable equipment. 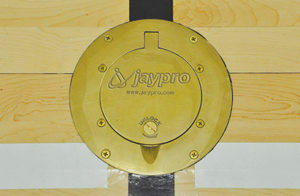 Our service and maintenance technicians will install Jaypro floor sleeves in your gym floor. The cover plates have either a chrome or brass finish and have a locking feature to keep out basketball deadspots.We can find solutions for the most complicated conditions! WallGuard padding offers four levels of protection to meet your needs: Basic, Impact, Fire and Fire/Impact that all meet the ASTM standards. Replace one panel or an entire wall, any shape or size. 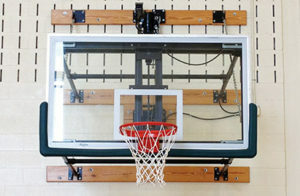 Scoreboards for any sport for indoor or outdoor use, many sizes, colors and options available. 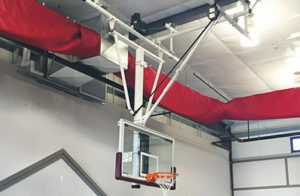 Intense use and repeated raising and lowering of backstops, curtains and other gym equipment can result in extreme wear on cables, pulleys and hinge points. Your facilities equipment is a vital component to your everyday activities, routine maintenance is essential for safe and dependable use. Need a qualified team to perform an inspection or annual maintenance? Let NEFS help you keep your equipment in top performing condition for years of safe and dependable use.